You are at:Home»Dairy-Free Recipes»Alisa's Recipes»Fruity White Chocolate-Covered Snack Bites: Vegan & School Safe! Fruity White Chocolate-Covered Snack Bites: Vegan & School Safe! 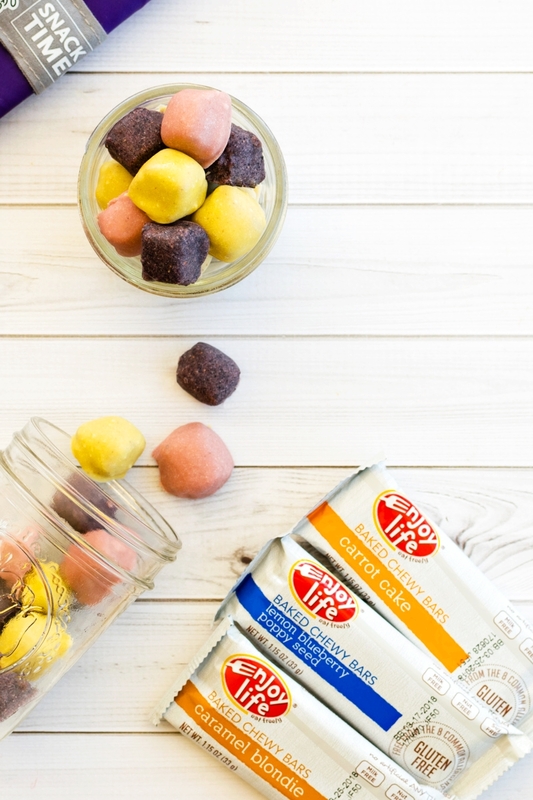 I created these fun and fruity white chocolate-covered snack bites to celebrate the launch of three new Enjoy Life Baked Chewy Bar flavors. Like all other Enjoy Life products, they’re school safe and kid-friendly. Every year, I see fun new treat and snack product launches for the back to school rush. But those clever ideas often have two problems. They’re usually loaded with questionable ingredients, and they typically harbor a top allergen or three. So how can food allergic kids and adults indulge in something tasty and whimsical without resorting to chemical-laden packaged snacks? We can get creative using real food to make our own fun treats! My most recent solution is these fruity white chocolate-covered snack bites. They’re chopped pieces of Enjoy Life Baked Chewy Bars coated in an easy, homemade, fruit-flavored and dairy-free white chocolate. 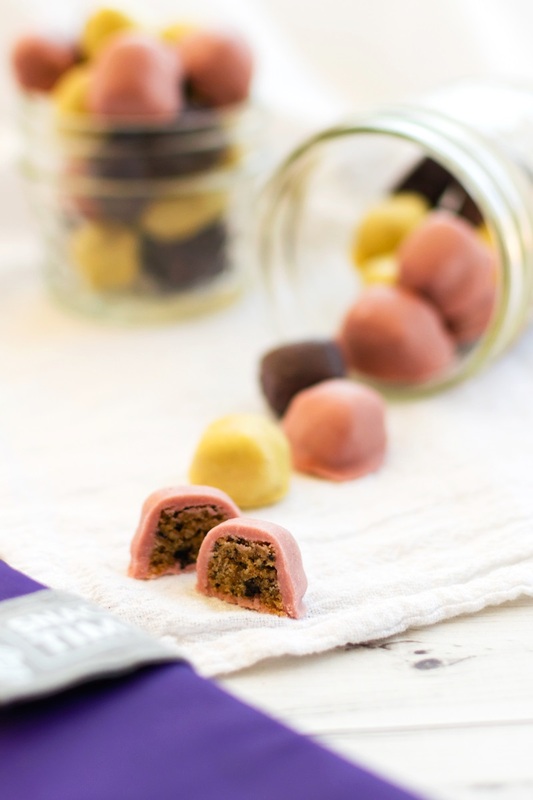 The Baked Chewy Bars are a sweet snack in their own right, but sometimes you’ve got to mix things up! The three new flavors of Enjoy Life Chewy Bars feature their new Pure Life Balanced Dry Blend™. It’s a nutritious mix of Sunflower Kernels, Cassava Flour, Sorghum Flour, and Quinoa Flakes. This post is sponsored by Enjoy Life Foods, but the fruity white chocolate snack bites recipe, photos, and writing are my own. 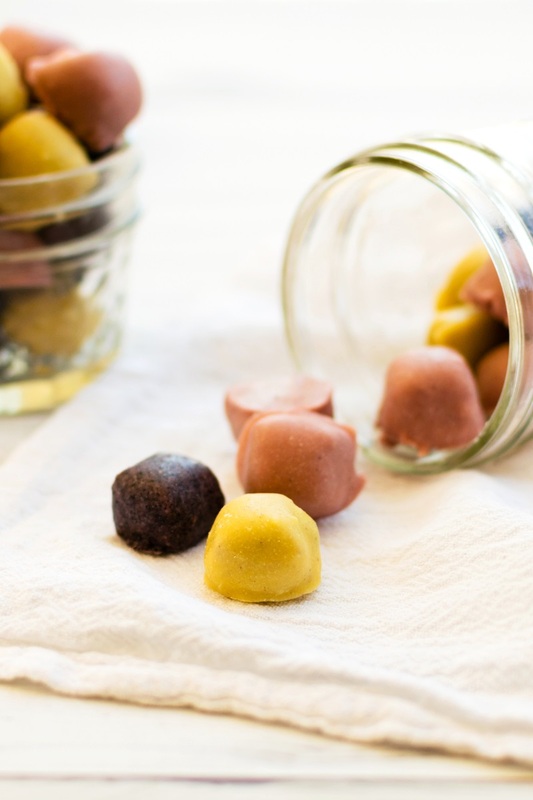 These fun snack bites are naturally colored and flavored with real fruit! They're also so easy to make, even the kids can join in. And don't worry, cocoa/cacao butter is a naturally dairy-free food! You can find it in the baking section of some stores or online. Cut each bar into bite size pieces. I cut them in half lengthwise to make two long strips. I then cut them in half horizontally and cut each half into thirds for a total of 12 bites per bar. Line a plate, cutting board, or baking sheet with parchment or wax paper. Place the snack bar pieces on the paper and freeze while you prepare the coating. Melt the cocoa butter in a double broiler or in a medium microwave-safe bowl in the microwave (it takes about 90 seconds). Sift the powdered sugar into the melted cocoa butter. Add the fruit powder, dairy-free milk powder, and vanilla, and whisk until smooth. 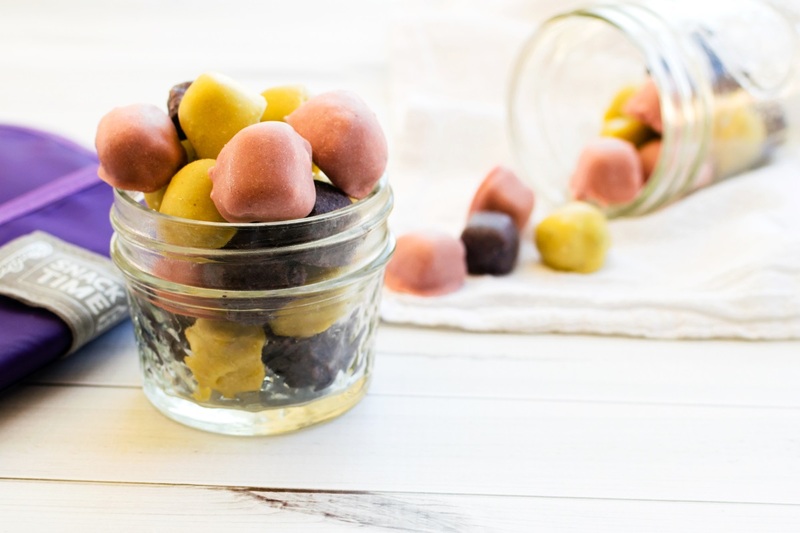 Remove the bar pieces from the freezer and dip them in the fruit chocolate to coat. I use a fork to remove them to help any excess drip away. Place them back on the paper to set up. Place the bites in the freezer for 5 minutes. If a thicker coating is desired, dip them again, and return them to the freezer for 5 minutes. 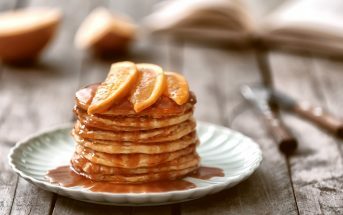 If the melted coating thickens up too much for dipping at any time, microwave it on HIGH for 10 to 15 seconds and whisk it. The bites will keep at room temperature in lunch boxes. But store them in the freezer in an airtight container or freezer bag for optimal freshness and longer storage..
Fruit Powder Note: You can buy some fruits already powdered, or you can buy freeze-dried fruit and grind it into a powder in your spice grinder or food processor. I tested this recipe with pomegranate powder and powdered my own freeze-dried blueberries, bananas, and Fuji apples. See the post above for suggestions of Flavor Combinations. Dairy-Free Milk Powder Note: Some brands of coconut milk powder actually contain milk, so be sure to seek out a dairy-free one, like this brand. If desired, you can substitute another milk powder or increase the powdered sugar or fruit powder to get the consistency needed for dipping. OMG LOVE it Alisa!!! Such a creative way to use the bars. I need to start my list of fun creations with those bars. I love that we both took the same thing and made something so different! Aw, thanks Sophia! I always love seeing what you whip up! This is such a creative recipe, I never would have thought to do this with granola bars! They’re definitely worth seeking out! They’re focusing so much on quality ingredients, and everything they make is allergy-friendly and plant-based! What a delightful little treat. You make it so easy an accessible to make allergy friendly stuff! This is such a genius use of the bars! I can’t wait to try the coating. Thanks Amanda; I hope you love it! 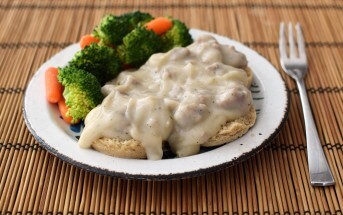 These look like a great snack to have all day long! The best part they would satisfy my sweet tooth too! I love the SunSeed Crunch and the Caramel Apple. Can’t wait to try the new flavors too. And these cute little fruity bites are genius! If you like those two, then you’ll love the Caramel Blondie and the Carrot Cake Jenn. The former has got chocolate chips added (never a bad thing! ), but has a similar flavor vibe. The latter is more of that spiced goodness. I was just thinking–I wonder what white chocolate she uses. GENIUS to make your own. Where do you suggest to buy the cocoa butter? These look so fun and delicious! I bet I’d pop a few too many of these little goodies in my mouth! I have been! I’ve got tons of them in the freezer from all of the testing and I keep sneaking them! Ok the title here says “white chocolate” so I was already sold hahaha. This looks so easy to make! These look so yummy and fun! Perfect for back to school. Love easy snacks like this one! Me too … and adults like them in lunchboxes, too! These look so fun! I love how easy to make they are. You are so clever. 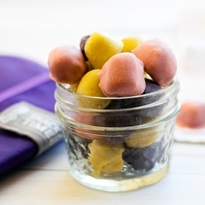 What a great idea to make a tasty treat even tastier…and more poppable! Such a fun and colorful snack! Love how easy these are to make! Sure to be a hit with kids and adults! Yes! I love being able to use real fruit for fun colors. We tried these bars and my kids loved them! I love the idea of covering them in white chocolate! YUM! Awesome! They really are a win with kids, but my husband and I really liked them too. I think I need a stash of these in my purse at all times! I’m such a huge white chocolate fan and I love the idea of using the bars as filling. Can’t wait to try these! Me too! That was my second dairy free concern (after ice cream – obviously I have a sweet tooth! ), so it’s fun to make my own. Such a fun idea! My kids are going to love these. Thanks Chrystal – definitely kid friendly. They are a godsend, especially for back to school. But yes, we adults love them, too!